The Winter X Games at Aspen Snowmass, Colorado continued its high flying competition Friday with four final competitions for Women’s Ski Slopestyle, Snowmobile Freestyle, Women’s Ski Big Air and Men’s Snowboard Big Air. In the Jeep Women’s Ski Slopestyle, Kelly Sildaru from Estonia received the gold medal after posting a near perfect score of 99.00 on her third run. This is the second medal Sildaru has won in Aspen this year, taking the silver in the Ski SuperPipe and is the third gold medal for the Slopestyle in the X Games. Right behind her was Sarah Hoefflin to seal the silver medal with a score of 90.00, her second medal in the X Games (2018 Gold – Ski Big Air). Rounding out the medals was Maggie Voisin, receiving bronze with a score of 87.66, her second gold and third medal overall in the X Games. 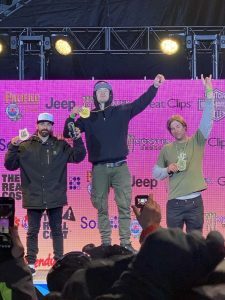 Coming out on top in the Snowmobile Freestyle with a score of 91.66 was Daniel Bodin, winning his fifth gold medal in the X Games, with the previous four coming from the Snowmobile Best Trick Competition. Brett Turcotte finished just a point under Bodin to win silver, a year after he finished first in the same event and sealed his sixth medal in the X Games. Placing in third for the second year in a row is Justin Hoyer with 87.33, who won gold in the event back in 2010 and silver in 2011. Swiss skier Mathilde Gremaud finished with a score of 83.00 and a gold medal in the Women’s Ski Big Air Competition. This is her second gold medal in the X Games, previously placing first in the same event in the Norway X Games in 2017. Following with a score of 80.00 was Johanne Killi. This will be Killi’s sixth medal in the X Games and the third silver medal. Finishing the podium was Kelly Sildaru with a 79.00. In the final competition of the night, Takeru Otsuka scored a combined 88.00 to seal the gold medal in the Men’s Snowboard Big Air Competition. This is Otsuka’s second gold medal for the second year in a row after coming in first in the same event at the Norway X Games in 2018. Three points behind Otsuka was Canadian Mark McMorris. This will be McMorris’ sixteenth medal in the X Games. Coming in at bronze was Sven Thorgren with a score of 76.00 which will be his second bronze in the X Games after winning third at the Aspen X Games in 2015.